The Great War is a not-too-distant memory, and England is still in the process of recovering from the horror and loss that it wreaked. Teenager Shirley Fearn lives in the small village of Westerbridge, where she attends the local school taught by Mr Tiller and harbours the desire to become a teacher herself. As the village prepares for the annual May Day celebrations, Shirley discovers Mr Tiller’s terrible secret, and learns of the missives he receives from a mysterious source. Mr Tiller has made it his life’s work to change the future of mankind, and enlists Shirley’s help. But where Mr Tiller sees something that must be avoided at all costs, Shirley sees only opportunity and a new form of repression that isn’t much different from that which rules her everyday life. When we first meet Shirley Fearn, she appears to be much like any stereotypical young lady from the early twentieth century: she is madly in love with her teacher, the mysterious Mr Tiller, and spends her days planning their future together. But Shirley has a spark of individuality, an ambition to become a teacher that sets her at odds with her family and friends. The Shirley who takes over the story as May Day arrives is a much different person to the young girl who has accompanied us thus far: she is more determined, surer of her own value to humanity. Mr Tiller has recently returned from the front lines, a limp the only outward sign of the terrible injuries that he has received. The women in the village see him as less than a real man while Shirley, blinded by her childish crush on him, sees his differences as a good thing. No, Mr Tiller is not what passes for a real man in these parts, and all the better for that. As the story progresses we learn the true nature of Mr Tiller’s injury, and the mental torture that comes along with it. Like Shirley, we are drawn into his confidence and become complicit in his plans to obey the plea that his mysterious missives carry, and of the possible future that awaits humankind. 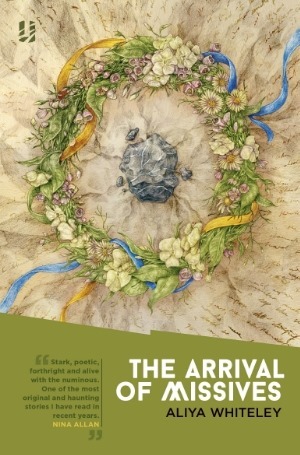 The Arrival of Missives, for all its brevity, is a story of two distinct halves. From the start, it’s a wonderfully-written examination of life in rural post-War England, and of the mind-set and mores of the people who populate it. In Shirley Fearn we have the perfect protagonist to guide us through this strange old world – a teenage girl who has hopes and dreams of her own, but whose life has already been mapped out in this male-dominated world by her parents to a certain extent, but mainly by the town and the town’s expectations. She feels herself inexorably drawn towards Daniel Redmore, a young man not much older than she is, but finds herself resisting partly because of Mr Tiller, and partly because it is assumed by everyone that they will end up setting up home together. The latter part of the story is an allegorical feminist manifesto of sorts, though by no means the hectoring, anti-male rhetoric that those two words suggest to many. When Shirley hears Mr Tiller’s missives first hand, something inside her breaks, and forces her to question her very nature. Mr Tiller’s future disaster seems much less troubling to Shirley, especially when she works out why. The reader is drawn into this argument and forced to decide for themselves: in much the same way that history differs depending on the teller, surely, too, the future must look different depending upon through whose eyes it is viewed. ‘It shows humanity,’ he says. What is interesting is how directly the book speaks to the speculative fiction community, and the frequently lambasted male-dominated science fiction community in particular. My only clue lies in the fact that they have one thing in common. They are all pale old men…how can there be no people of China, or the East Indies? No youths? No women, no women at all? How is that possible?…I will not be a foot soldier for pale old men, no matter where they live or what pretty patterns they weave. It is, undoubtedly, an important message, but one that is interwoven so closely with Shirley Fearn’s tale that it comes as a natural consequence, rather than as the aforementioned feminist manifesto around which a story has been constructed.